Inlay in natural stones is such a magnificent work of art that anyone would wish to have it for their space. If you are wondering what exactly is inlay work just have a look at the Taj Mahal. It is one of the best examples that showcase the 'Marble inlay' work. To be precise, inlay work in natural stones is a traditional art in which delicate precious stones are inserted into the base stone to give a unique, magnificent design. Today, very few experts are skilled to perform this technique. 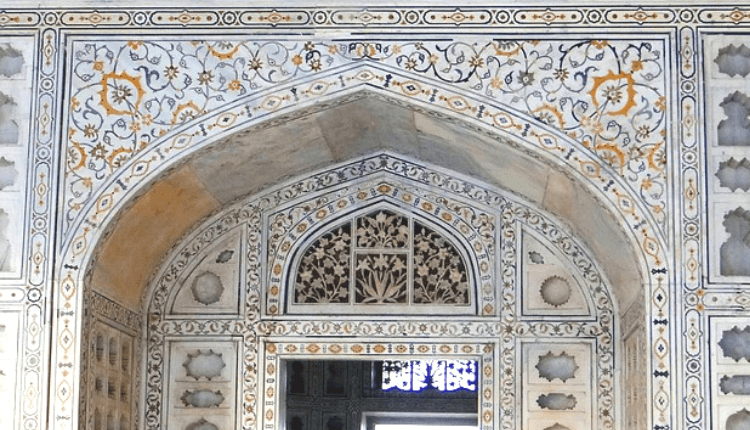 As far as the history is concerned, the introduction of the inlay work in India was majorly witnessed in architectural innovations of Mughal Emperor Shah Jahan. This art resembles the 'Pietra Dura' art of Italy which was carried out in the 16th century. This art was profusely applied on decorative panels, bird and flower motif, table tops and cabinet fronts. Some of these reached the Mughals as presents and this is how it arrived in India. Let us know more about the inlay work with natural stones. If you are planning to embrace the art for your space this will help you climb the first step in understanding its application in modern time. Which Precious Natural Stones Are Used In Inlay Work? 1. Turquoise - Turquoise is a gemstone chemically composed of basic hydrous copper aluminum phosphate. It gets its blue colour from copper and green from iron. The gemstone is perhaps one of the oldest ones to be worn by Pharaohs and Aztec kings. Hence, its finest quality is found in Egypt and Persia. Today, shining sky blue Turquoise is a popular trend in art and crafts. 2. Coral - Coral is an organic stone that grows on rocky seabeds. It is found mainly in Japan and Italy. It is basically composed of calcium carbonate and 3% of magnesium carbonate, organic matter and trace of iron. Coral is found in many colours like red, pink, scarlet, saffron and white. 3. Cornelian - Cornelian is a type of chalcedony (a mineral of the quartz family). The stone is abundantly found in India. Deep orange to orange-red tone is popularly used when it comes to cornelian. It has a translucent look with a vitreous and silky glow. 4. Amethyst - Amethyst is a type of quartz composed of silica. The stone gets its purple colour from the presence of manganese. It appears transparent to translucent. It was believed by the Ancient Romans and Greeks that it prevents intoxication. It is mined in Brazil, Uruguay, Bolivia, and some African countries. 5. Jade - The existence of Jade traces back to over 7000 years. It is known for its toughness which comes from its composition of nephrite and jadeite. Due to its nature, it was referred to as ‘Stone of Heaven’ and formed the basis of Chinese culture. It comes in shades of green and has a greasy shine. 6. Tiger's Eye - This gemstone is mainly made of silicon dioxide. It has a vitreous lustre with its black colour coming from iron and yellow and golden brown stripes from oxide staining. Each stone appears different in colour depending on the nature and number of inclusions. It is found in Brazil, Burma, Canada, India and US. 7. Onyx - The stone was popular among Greeks and Romans, hence its name is derived from the Greek word 'onux' meaning fingernail. Onyx is a rarely found stone known for its elegance and vividness. It appears translucent with natural colours ranging from green to exotic honey. 8. Agate - Agate is a fine-grained varicoloured chalcedony. It is translucent and coloured in stripes and mixed in clouds which seems moss-like. It comes in wonderful shapes, forms and layers. It received its name from its occurrence at the Achates River in southwestern Sicily, Italy. It is also found in the US, Brazil and Uruguay. What Goes In Achieving The Inlay Work? Inlay work in natural stones involves a process of hand cutting and shaping. To begin with, the design is planned such as floral or geometrical design and the same is cut out on a brass sheet. The cut brass sheet is placed on the base stone like marble, drawn and the base is delicately carved out. Next, the coloured stones like gemstones are shaped and polished and then slipped into the base stone grooves with an adhesive. Later, when the inlay work is complete and dried, the surface and edges are polished to deliver a glistening finish. The polish work is carried out using a stone bar to provide long-lasting shine. The final product is packed in thermocol sheets to protect it from all sides. Makrana Marble used in Taj Mahal is the most preferred natural stone in inlay work. However, for any reason, if the white marble is not used, Black Stone (a type of sandstone) or Green Marble are chosen. And for the colour natural stones, there are many varieties. Today, inlay stones are popularly used in flooring and different types of table tops like a coffee table or side table. The table tops can come in different colours and shapes including rectangular, square, oval, octagonal etc. Marble inlay flooring is the most preferred due to its eye-catching aesthetic look. The right choice of pattern, design and colour combination in marble inlays is enough to provide the ultimate glamour to your home interior. There are black marble tiles and white marble tiles but it is important to choose the right location for their application. 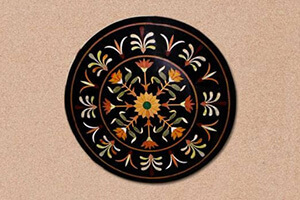 Inlay work can even be beautifully applied in a temple room, hallway, and kitchen. The art of inlay work in natural stone is an intricate and delicate process that requires special skills. In India, there are very few genuine experts that have preserved the traditional technique until today. You can find the art alive mainly in Agra, Rajasthan, and Uttar Pradesh. QM India, situated in Udaipur, Rajasthan is one of those who has a team of experts with the traditional skills in inlay work. We supply stone crafted inlay table tops and flooring that can heighten the aesthetics of your home or commercial space. If you are planning to turn your home into a luxurious one reach out to us for a customised inlay work of art!